DO YOU EVER CRAVE SOLITUDE? Do you ever feel like sometimes you just need a bit of alone time? Maybe a few moments to unplug. This little fellow and I seemed to be on the same wave length (yes - I know - pun intended). On the beach one evening, we were both enjoying the company of our own shadows when we crossed paths. We stopped, I took his photo and then we each moved on. If a bit of solitude is what you seek this weekend, then I hope you find it or it finds you. I was travelling light that evening, carrying my Sony A7r paired with the nearly as heavy Nikon 85mm 1.4 lens (which is still a lighter combo than my Nikon body with any lens). I was having a tough time learning to love the 85mm lens at first, (earlier post on this here) but lately it has been my go-to. On the Sony I have to dial the aperture manually on the adaptor and as you can probably tell from the shallow depth of field in this case it was wide open (or small f-stop). Nailing the focus (also manual) I still find quite tricky - even with the focus peaking on. The number of keepers is still pretty low but every now and then I get one good enough to get me trying for more. As for processing - I started out with some minor adjustments in Lightroom - lowered the highlights, upped the shadows, lowered the clarity to get a softer look. Then moved it into Photoshop and used Noiseware and Color Efex Pro. Also ran a blur filter on the ocean and sky to further soften them so they would be less distracting. Finally sharpened up the bird a bit. Nature has thrown some fierce winter weather at us here in Southern Ontario. Freezing rain storms, snow squalls, sub zero temperatures - all this and the season is less than a month old! With the weather conspiring to keep me inside the result has been a forced pause in "doing" and a distinct increase in "thinking." I don't usually do my dreaming/ scheming/ planning at this time of year. Normally I'm like a kid in school and break out the goal setting in September. But who am I to argue with Mother Nature? She has her icy grip on me and I am frozen - stilled. We are still only a few days into it. I hope that before life in 2014 starts to gather momentum, you have a chance to take a deep renewing breath. That you get some space to consider, dream and plan something wonderful for the upcoming year. Here's to making 2014 spectacular. Like many areas of North America, the part of Ontario I live in has seen some pretty intense winter weather lately. 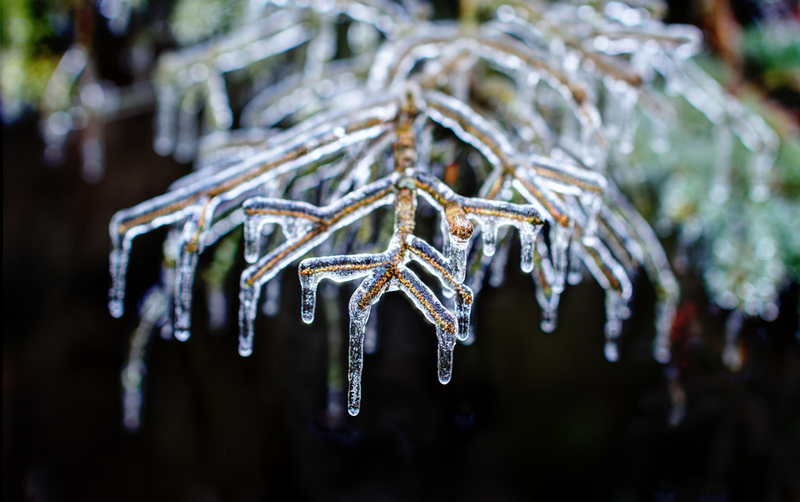 The photo above was taken in December 2013, two days after a terrible ice storm covered the land in up to as much as 15 mm of ice. The tree damage has been significant. Downed power lines knocked power out for 15 hours for us and unfortunately much longer for many others. But always there is a bright side. When the storm had passed, the setting sun lit up the trees in my backyard as if they were decorated with sparkle lights. The beauty was awe-inspiring - I fear my image only hints at it. There is something magical about December. Perhaps it's because here in the northern hemisphere the days are getting shorter. Or rather more to the point, night comes earlier and lasts longer. Candles, twinkle lights, fire light - they all owe their enchantment to the dark. Without shadow the light would would be undefined. It's the contrast that makes things interesting. The Christmas Market in Toronto's Distillery District is charming. We arrived around 4pm and wandered around enjoying all the displays and poking in the stores. But as night fell and the shadows grew, the lane ways lined with glowing gas lamps and twinkling lights morphed into a more captivating world. Even the horses on the brightly lit carousel seemed to come to life. As photographer, I find I'm always paying attention to the light... but my newest discovery is that there is magic in the shadows. So embrace the shadows of December my friends and have a magical weekend. It’s been a long time since I’ve been here. My sincerest apologies. Life throws curve balls, and while you are sorting out the fall out, time marches on. Quickly it seems. My mother unfortunately suffered a stroke in April and while she is doing well now, things have been anything but normal. Ironically the first thing I gave up when the time crunch hit was my photography. It brings me such joy, yet I dropped it like a stone. A curious thing. One I am still pondering. In the mean time, my first post “back at it” is of a long time beloved subject - flowers. The photo above was taken this week on a hike at Kelso Conservation Area. We have had some lovely cool weather (much cooler than normal for this time of year) which not only made the trek up the escarpment quite comfortable but has also meant a later spring and delayed bloom times. This bank of poppies growing near the old Alexander farmstead at the foot of the hills were nearly finished but still lovely enough for a photo. I just adore the vibrant colour and tissue paper texture of the petals. And the purple black colour of the stamen... the perfect accent. Of course poppies always make me think of Remembrance Day, and ironically today is the 69th anniversary of D-Day. The turning point of World War II. 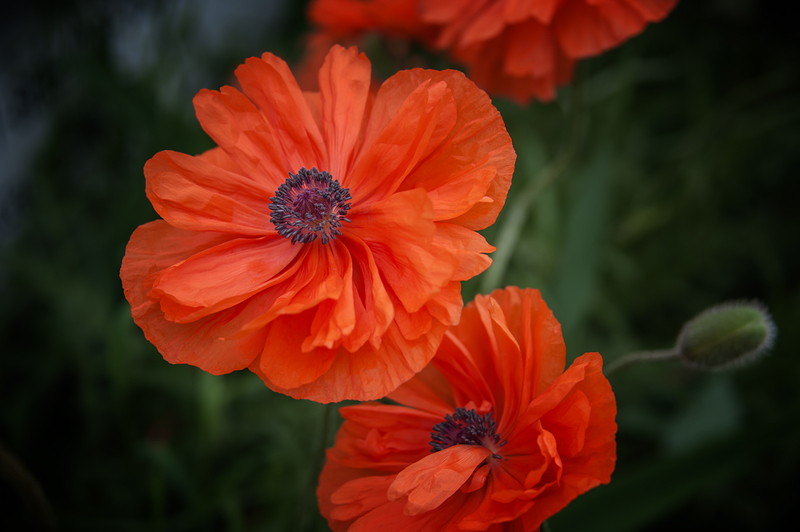 How fitting then that the photo I chose to process and post today would be of a poppy - the symbol of remembrance. So time may pass, and change may cause a distraction, all is not forgotten. I’m thrilled to be back. Hope you’ll join me again soon for more posts. Nikon D700, 28-300 mm, f/3.5-5.6Single raw, hand held, processed in Lightroom then over to Photoshop for polishing with Color Efex Pro & Noiseware.